Faneuil Hall bustled yesterday afternoon as tourists and shoppers roamed the stores and performers danced, played instruments, and posed for pictures. But the horse-drawn carriages, many of them covered in tinsel and Christmas decorations, stood motionless. 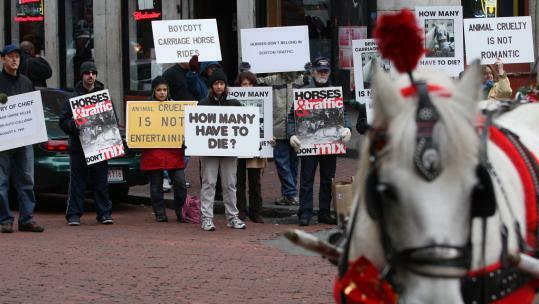 About two dozen protesters from the Massachusetts Animal Rights Coalition, a nonprofit organization that advocates for the humane treatment of animals, held signs and handed out fliers that called for banning horse-drawn carriages in Boston. The protesters gathered at the corner of Chatham Street and Merchants Row, where hansom cabdrivers park, waiting for business. According to the activists, horses pulling carriages in cities face a variety of threats, including traffic, hoof deterioration, exhaustion, and the extreme temperatures of the hottest and coldest days. But drivers yesterday insisted that their horses are treated well. "They're well-taken-care-of animals," said Tim Lorden, who has driven horse-drawn carriages for 22 years. He gestured toward his horse, Mikey, and said, "These guys are tough." Protesters said one of the horses died in October 2005 after collapsing from exhaustion. In 1997, they said, another horse had to be euthanized after a truck rear-ended the carriage he was pulling near the Government Center Garage. After the horse's death, the Boston Transportation Department banned carriages from operating on weekdays before 6 p.m. without a special permit. "I ride a bike in Boston," said protester Jeremy Mendelson. "It saddens me that people use animals in a way like this. I choose to ride in traffic, but these animals, they don't have a choice." Driver Dianne Horwath has been a driver for nine years, and said her horse, Mike, has never been at risk. "I know the care that goes into these animals," she said. "These horses would never be in danger." Horwath pointed out reflectors on the ankles and breastplate of her horse as an example of safety-consciousness among equine caretakers. She also said the economy had already been hurting her business, and the protesters lining the street were discouraging potential customers from taking a ride. For at least 90 minutes during the protest, no one stepped into a carriage. The Hackney Carriage Unit of the Boston Police Department oversees horse-drawn carriages. Officials from the unit could not be reached yesterday to comment on the protesters' allegations. "Horses don't belong in city streets, they belong in fields," said Helen Rayshick, one of the protest organizers. She said the group, which has about 2,000 members statewide, decided to protest yesterday - quietly, with no chanting or shouting, so the horses wouldn't be spooked - to capture the attention of people who might be open to reconsidering their thoughts on horse-drawn carriages. "This is important, especially at the holidays, when people are out and they're full of good will," she said. "And we can extend that good will to others." Matt Collette can be reached at mpcollette@globe.com.